moton will present the motan Gravicolor batch gravimetric dosing and mixing units in FAKUMA. There are six models of the series and last year, the company manufactured some 2,500 units which have been already installed at customer sites. Moton says, initiated by the market conditions, the Gravicolor possess excellent recipe conformity and flexibility when it comes to the processing of different raw materials, and is suitable for a variety of applications. As claimed, constrained by economic circumstances, plastics processors have been increasingly forced to use more regrind material in the production process. Meanwhile, ever rising quality requirements demand reproducible recipe accuracy with indispensable detailed report functions. These factors combined have resulted in introduction of the gravimetric batch dosing and mixing units. According to the company, six models of the series with throughputs of up to 2,200 kg/h satisfy a wide variety of production requirements. 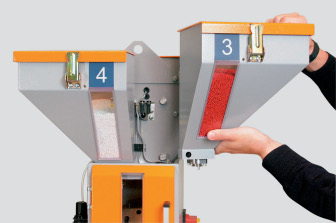 Gravicolor 30MD (micro dosing), 60 and 100 apply to very small and small flow-rates as stand-alone units alongside injection moulding machines. For large material throughput in injection moulding and extrusion, Gravicolor 300, 600 and 1000 are most suitable – either mounted directly above the processing machine or as a central mixing station. To guarantee maximum mixing precision and to avoid bridging, a cone dosing system is used, except with very small material throughputs and in these cases; the patented motan micro-dosing system is employed. All Gravicolor dosing and mixing units are extremely flexible in operation with precise batch weighing of up to six material components. Dosing and mixing is enabled using IntelliBlend technology, implemented by the Gravinet control. As an intelligent, self-optimising system, its objective is to achieve optimal mixing precision with the batches being processed. Among other features, the control automatically determines the most advantageous sequence of all component parts of the set recipe. Besides, throughout the dosing process of the individual components, the dosing rates are continuously monitored, and if required, updated. As a result, fluctuations in shot weight and material-dependent flow factors are taken into consideration and compensated. IntelliBlend immediately corrects tolerances by adjusting subsequent component blends precisely. Following the completion of each material charge, any potentially remaining discrepancies are corrected in the subsequent charge. Thus, an unparalleled high degree of recipe accuracy is achieved. The motan Group, with its headquarters in Konstanz on Lake Constance in Germany, was founded in 1947. While well known for providing sustainable materials handling, the company is active in injection moulding, blow moulding, extrusion and compounding, in-line and chemicals.